MWC Shanghai’s Conference session on “Virtualising the Network” included carrier, vendor and industry association representation, providing broad and diverse insights on the topic of NFV. While many, varied insights were shared over the hour-plus session, a few stand out: the importance of culture to getting NFV rolled out, the view of NFV as a multi-layered network architecture, and the relative immaturity of NFV as a telecom technology. The GSMA held its Mobile World Congress Shanghai last week, from July 15th through July 17th. Per the organization, attendance came in at close to 40,000 unique visitors from 100 countries and territories. Open to “technology-savvy consumers” it’s probably not surprising that an exhibition held in the world’s most populous city attracted so many attendees. The fact that 3,400 people, then, were registered as conference attendees (including educational sessions) may be a better indication of the event’s stature; while not on par with the Barcelona edition of Mobile World Congress, it was still a sizeable event with insights to lend. On the topic of NFV, many of those insights were captured in a conference session I moderated, with panelist support from the TM Forum, China Unicom, ZTE, and F5: NETWORK EVOLUTION: VIRTUALISING THE NETWORK. With such a varied set of panelists, the session content was understandably wide-ranging. Three takeaways, however, stood out – repeated by, or resonating across, the panel. 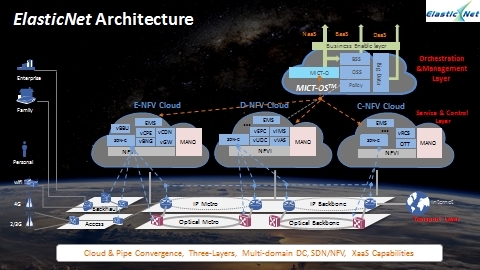 Multi-Layered NFV Architecture. During his presentation, ZTE’s Larry Ma (Principal Architect) outlined the company’s “ElasticNet” NFV architecture. Inclusion of transport, NFVI, MANO, and OSS/SS components isn’t particularly unique – they’re all par for the course with any vendor offering up an end-to-end solution. What was unique, however, was calling out three different NFV “clouds” – edge, distributed, and cloud. To be sure, other vendors will note an ability to support NFV in these different network locations. Identifying them as distinct deployment models, however, reminds operators of the flexibility NFV offers and signals the different values each deployment model (accompanied by more, or less, appropriate VNFs) brings. NFV Infancy. If there was one constant across the presentations, it was a discussion of trial and PoC momentum vs. commercial deployments, combined with an explanation of NFV promises and expectations. Does any of that sound characteristic of a mature market? Of course not. While we might take for granted the inevitability of NFV, the reality is that it’s still a new technology – still waiting to be proven. When a broad set of industry players comes together to talk about it, this reality stands out. Technology vs. Culture. Where the TM Forum is represented on a panel, you know that “process” and back office requirements will be on the agenda. Yet, as the MWC Shanghai panel acknowledged, the fact that NFV represents a new technology implying new processes and skill sets ultimately complicates its deployment. Even where NFV is mandated from the C-suite, carrier culture represents a major obstacle to the smooth implementation of NFV into carrier operations. Will that extend its infancy period? Will it limit the extent to which operators exploit various deployment models? Will it extend the length of PoC activity? If the answer is “yes” to all of these, it’s possible that “culture” dominates all of the other issues facing NFV.